In August 2007, High Road Strategies did an extensive survey of relevant literature on information technology applications that could enable gains in energy efficiency and energy saving across multiple sectors of the economy, over a time frame from the present to a over decade. 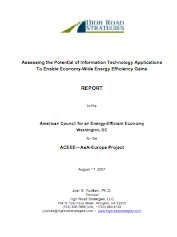 The study was conducted for the American Council for an Energy-Efficient Economy (ACEEE), in Washington, DC, and used as a reference for a report ACEEE produced for AeA Europe, that assessed the potential for the high-tech sector to address the challenge of climate change through energy efficiency improvements in the European Union. * The results of the survey were summarized in a report Assessing the Potential of Information Technology Applications to Enable Economy-Wide Energy-Efficiency Gains (August 17, 2007) (pdf). The four sectors examined—buildings, industrial professes, transportation and energy supply—rely heavily on energy for their operation, and account for most of the greenhouse gas emissions generated in modern economies. The study explored the IT opportunities that could make significant improvements in how energy is managed and used (and generated, in the case of the energy supply industry) in these sectors. The time horizons for their implementation and widespread diffusion. The IT applications can be characterized as a series of layers. Lower layers consisting of digital devices and software tools can stand alone as important energy efficiency innovations, though many also serve as integral components of higher levels, characterized by increasing levels of networked operations. At the highest level are broad visions of integrated advanced communication and control systems, such as the “smart grid” in electricity generation, energy management information systems (EMIS) in manufacturing, energy information systems (EIS) and energy managements systems (EMS) linking buildings and utilities, internal building energy management controls and smart end use devices, and “intelligent highway systems” in transportation. * John A. “Skip” Laitner and Karen Ehrhardt-Martinez, Advanced Electronics and Information Technologies: The Innovation-Led Climate Change Solution, Brussels & Washington: AeA Europe, ACEEE, 17 September 2007.